Beyond Genealogy: No News is Still Good News, Right? 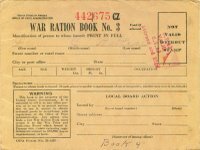 The other day someone told me that I was wasting my time by scanning and indexing war ration books that had little (or no) information on them. I tried to explain to him that as a genealogist, it is better to know that a document does in fact exist, but has little informative value, than in endlessly wondering how to locate it. He didn't accept my argument. Don't genealogists have to accept that along the way they will encounter genealogical duds? I have a death certificate of a female ancestor and the maiden name is blank. I was certainly bummed when I got the document, and even more confused when I saw that the witness (i.e. person providing the information) was the woman's son! He didn't even know that detail about his mother. Up until that point, getting that death certificate was my sole quest. Once I saw it, even though it was disappointing, I was able to move on. Ration books have so many cool pieces of information (when they are filled out properly), which is much like so many other documents genealogists crave. When I acquire these documents, I don't always know how complete they will be, and I see no reason not to scan/archive the ones which are lacking. Ration books are also somewhat unique in that they have series and serial numbers on them, so even the blank ones can yield relationship information by noting the books that are in the same series and serial number range. You may not be able to tell who were the parents, but you'll have a good idea that they were all in the same household. I was always fascinated by the Columbo movies. As a detective, Columbo was able to piece together a murder mystery with the smallest of clues. As a genealogist, sometimes these partial documents can be just as important. Genealogical duds are a fact of life for researchers. If you can think of a better argument for me NOT to scan/index these partial documents, I'd love to hear it.